Just a single game again for this week. It is also one we have seen before so I decided to re-write what I had. 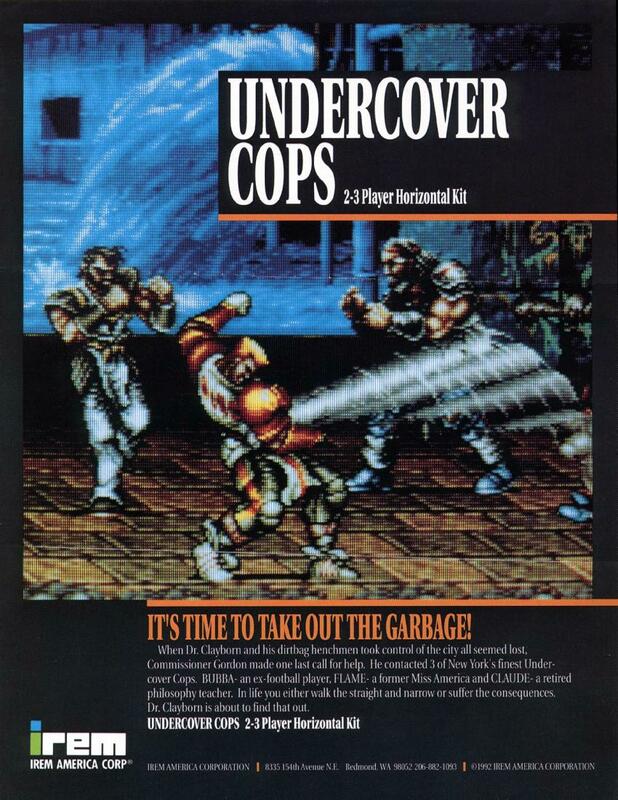 Undercover Cops was created by Irem and released in 1992. Undercover Cops is a 2.5D beat 'em up. The year 2043 and Dr. Clayborn and his henchmen have seize control over New York. Commissioner Gordan has contacted you one of the top undercover cops in New York to become a city sweeper. Your task is to defeat Dr. Clayborn's henchmen and their minions and finally Dr. Clayborn himself to bring the city back from chaos. Bubba - Code Name: Fire Ball Crusher - An ex-pro football player, after being falsely accused of murder he was banished from the world of football. Flame - Code Name: Blue Gale Revenger - An ex-Female vigilante, After her lover was killed by some criminals she turned to the police force. There is five stages that you must fight through to cleanse the city of Dr. Clayborn. Each stage has a multitude of minions and a boss battle at the end. The enemies you fight throughout the game never drop their weapons but during each stages many objects can be picked up such as steel girders, concrete columns, oil drums, etc which can be used as weapons. To restore your health, food sometimes drops from creates and barriers. You will also find Mice, frogs, birds, etc when picking up opjects and are also dropped by some minions. These animal will also restore some of your health.